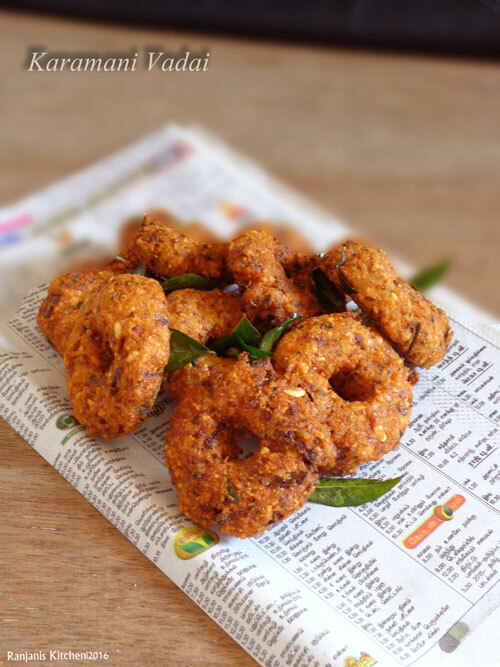 Karamani vadai – healthy and fibre rich snacks recipe to have on your tea time. 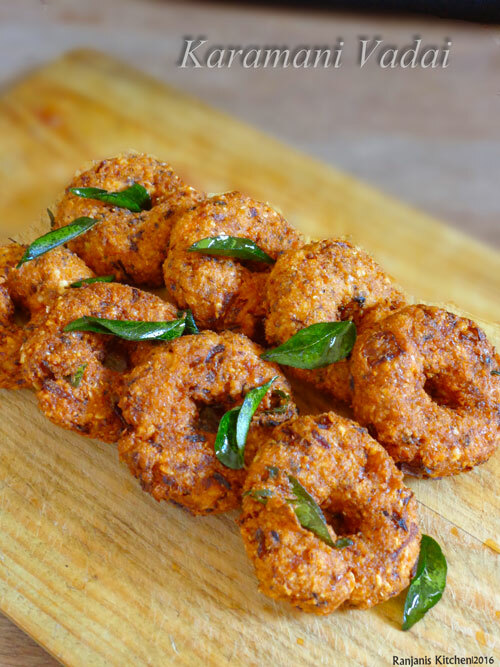 If bored with usual snacks, you can make lentil vada and impress your kids 🙂 This recipe called in many names like alasanda vadalu in telugu, cow peas vada, black eyed beans vada,lobia vada etc., you can try this patties as a variation of medu vada and masal vada. Soak karamani overnight or 4 to 5 hrs and grind and mix up with available ingredients to make this recipe. This karamani vadai is crispy outer layer and soft inside. I put hole in centre to avoid uneven cooking in centre.You can make very small patties and make crispy vadas without hole. 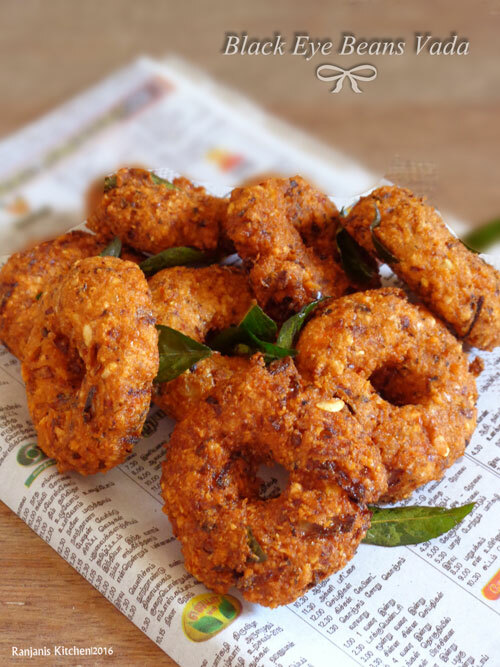 This deep fried patties is famous in Andhra and they prepare this recipe for sankaranthi. Soak karamani in water overnight or 4 to 5 hrs. In mixer jar. Grind red chillies and fennel seeds coarsely and keep aside. In the same jar, grind karamani to coarse level along with salt. Add chopped onions, ginger garlic paste,curry leaves,carrot and coarsely grounded red chilli to it. Mix well to make patties. Heat a kadai, add enough oil to deep fry vadai. Pinch a small portion from the vada batter, and form as round patties using your palm and make a hole in centre using your finger. Put it in hot oil and deep fry in medium low flame. Fry till golden on both sides. Drain oil and place it in kitchen tissue.Serve hot with chutney or sauce. Instead of red chilli , you can add green chillies also. No need to grind them. Chop thinly and add it to batter. 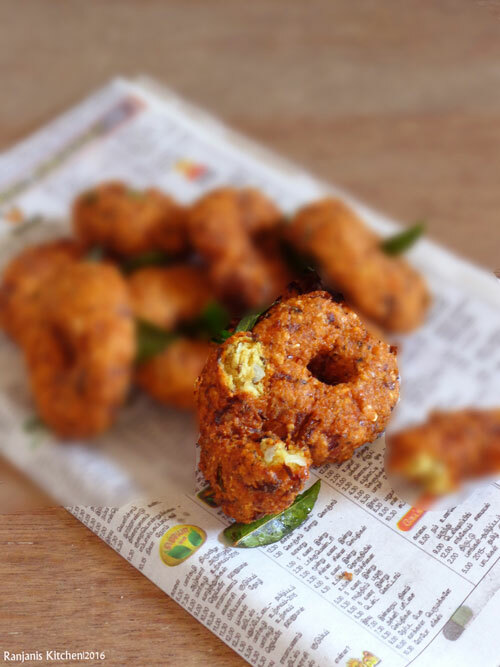 While frying the vadas, keep the flame medium low to not burn the vadai. Add handful of chopped coriander leaves if you want. Awesome vada. very good presentation.